Those who know the code of the Pimms will know that the blogs on this site are consistently honest. No fake news here, or indeed fake reviews. So I have to report, sadly, that “Stiff Upper Lip, Jeeves” was not my favourite P G Wodehouse book. In fact, of the mouth-watering shelf-full of Wodehouse I have enjoyed so far since 2017, it comes some way behind Thank You, Jeeves, Ring for Jeeves, Aunts Aren’t Gentlemen or indeed Jeeves and the Feudal Spirit, all of which I have reviewed on this site (click on links above) and all of which positively heaved with quotables. To say that Stiff Upper Lip, Jeeves is less hilarious than some other P G Wodehouse masterpieces, however, is not to say it lacks humour. I feel it has less of a story, and Bertie Wooster finds himself in fewer memorably delicious situations, than in some of the other stories. But it is nonetheless full of laugh-out-loud moments and has plenty of quotable excerpts. He swallowed once or twice, and his colour deepened, which took a bit of doing, for even when his soul is in repose he always looks like a clerical beetroot. Show me a delicately nurtured female, and I will show you a ruthless Napoleon of Crime prepared without turning a hair to put the screws on some unfortunate male whose services she happens to be in need of. There ought to be a law. I suppose there’s nothing that braces one more thoroughly than the spectacle of the forces of darkness stubbing their toe. ‘You haven’t seen Gussie, have you, Jeeves?’ He made no reply, possibly because he wasn’t there. He generally slides discreetly off when the young master is entertaining the Quality, and you never see him go. He just evaporates. How long I remained motionless, like a ventriloquist’s dummy whose ventriloquist has gone off to the local and left it sitting, I cannot say. Oh blessings on the falling-out that all the more endears is the way I heard Jeeves put it once. I once read about a man who used to drink twenty-six Martinis before dinner, and the conviction was beginning to steal over me that he had had the right idea. ‘So I would be disposed to imagine, sir. And your disturbed nights left you ruffled, I am sorry to see. You are far from soigné.’ I could, I suppose, have said something about ‘Way down upon the soigné river’, but I didn’t. My mind was occupied by deeper thoughts. Stiff Upper Lip, Jeeves was published in 1963. 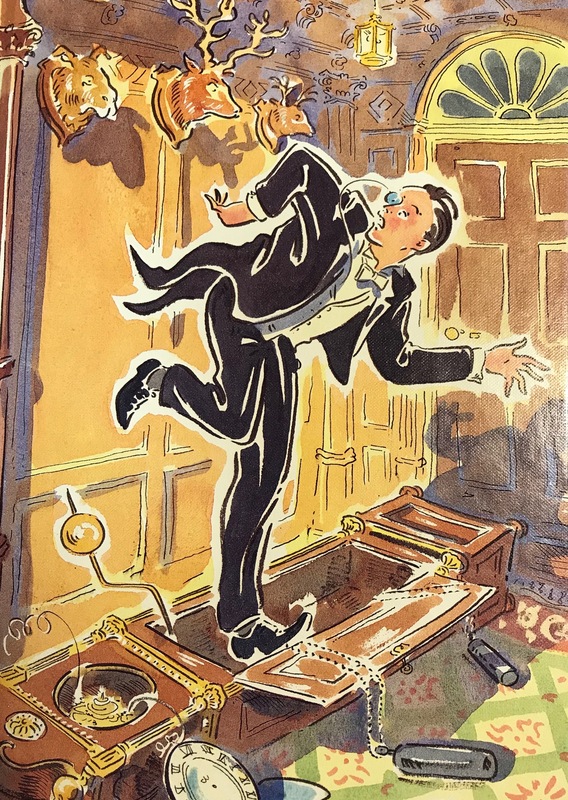 So there seems to be no pattern to the excellence or otherwise of the output of “Plum” Wodehouse – some of his early books are terrific, but then so is Aunts Aren’t Gentlemen, published in 1974, and the last Jeeves novel Wodehouse wrote. I look forward to reading the rest. P.P.S. If you, too, appreciate Wodehouse, I recommend Plumtopia, a P G Wodehouse specialist. By Robert Pimm in PG Wodehouse, Reviews, Robert Pimm, Writing: about writing on 14/07/2018 . Thanks for another fun review (and the kind recommendation). It’s been a few years since I last read “Stiff Upper Lip, Jeeves” and I confess it’s not my favourite either — with over 90 volumes of Wodehouse to choose from, the competition for that honour is as stiff as Jeeves’ upper lip. I did enjoy it though, and it’s certainly a ‘must read’ for any Wodehouse addicts who’ve followed the romance of Gussie Fink-Nottle and Madeline Basset in the earlier stories. Greetings Honoraria! Always a privilege to hear from a true connoisseur of all things Plum. I plan next to focus the remaining Pimm grey cells on the rest of the Jeeves & Wooster canon and see what wisdom ensues – still so much to enjoy. As for kind recommendations – my pleasure! We bloggers must stick together. Thanks Robert — always enjoy your stuff. Hope you enjoy the next Jeeves installment! My favourite among those quotes is the Soigné River. Hmm yes I could not decide with that whether I loved it or hated it. Great review, Robert! Shall soon catch up with your other Plummy posts. Hope a re-blog would be fine by you. Regards. Delighted you enjoyed it and do dabble in the others! Reblogs most welcome.